With the iPhone 6 (and 6 Plus) launch just around the corner, this may be a good time to review smartphone market share and usage share trends around the world. As these data points reflect the tail end of the iPhone's product cycle, we should expect a market share bounce over the coming months. On the other hand, movements in usage share are unlikely to be as sharp. Because of the regionally fragmented nature of distribution, some view global market share figures with cynicism. My argument was that market share patterns by country could give us a better understanding of these trends. While market share of shipments is certainly a leading indicator for install base (and consequently, usage), it only gives us a part of the story. Contrasting regional market share and usage share (as a proxy for install base) may give us an even better understanding. 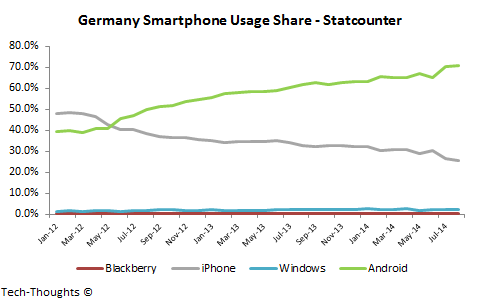 Usage share (or browsing share) isn't an ideal proxy for install base as it could be skewed towards higher end devices. 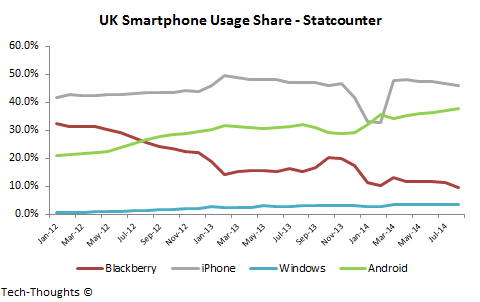 However, trends in usage share could give us a fairly good understanding of the underlying install base. While this is only helpful for countries where both sets of data points are available, there are few major markets that are excluded (India and South-East Asia being notable exceptions). Now, here are the metrics for each country. As expected, the iPhone saw a cyclical decline ahead of the iPhone 6 launch. 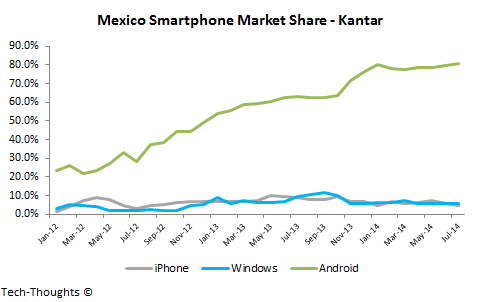 But the chart also shows that the iPhone's market share began declining YoY in late-2013. This suggests that T-Mobile's and AT&T's unsubsidized "value plans" have had some impact. 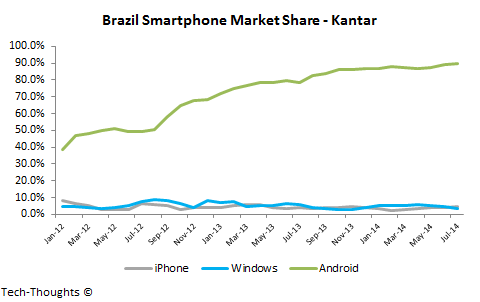 This combination of factors has led to Android hitting an all-time high in both market share and usage share. The iPhone 6 launch will certainly have an immediate effect on this trend. It will be interesting to watch the scale of this impact. 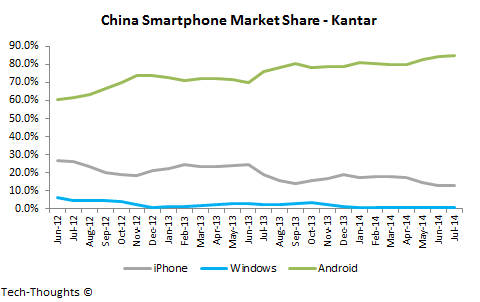 In terms of pure volume, the Chinese market has been dominated by Android (or AOSP, as some prefer to call it) for years. 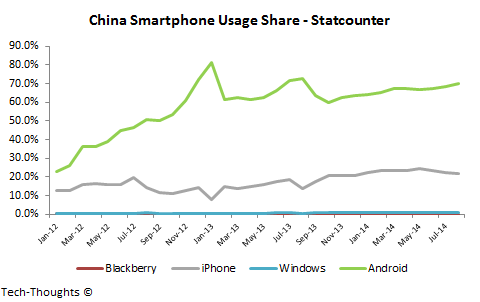 Of course, China is the largest smartphone market in the world by such a large margin here that it is lucrative to even be a niche player here. This brings us to the iPhone -- The iPhone has continued to lose market share to Android, mainly because of massive volume growth at lower price points. 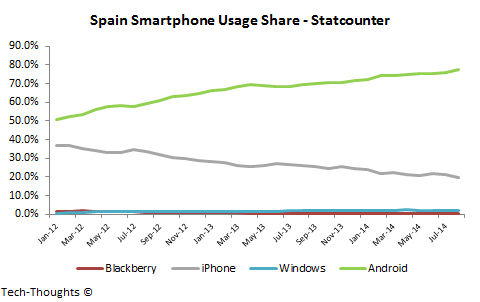 However, both the iPhone and Android have increased usage share at the expense of legacy platforms like Symbian. The iPhone has seen a notable drop in market share and usage over the past few months, but this came at the end of the iPhone 5S product cycle. 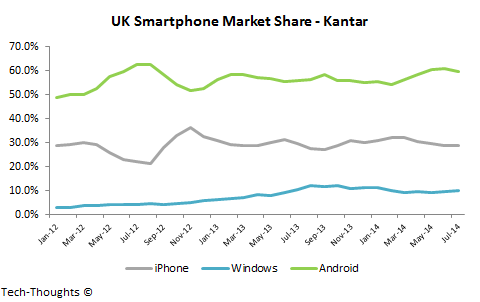 Over the last few years, the UK has been one of the most predictable markets in the world in terms of market share. 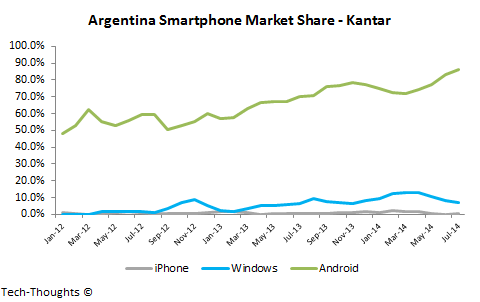 It is one of the iPhone's strongest markets across the globe and is quite cyclical as a result. 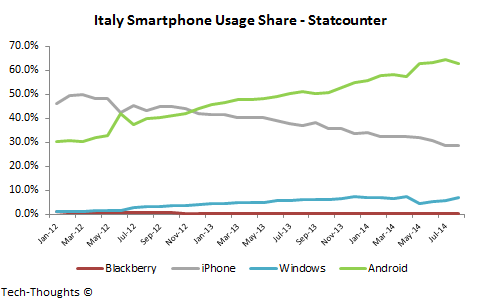 Usage share, however, is a different story. 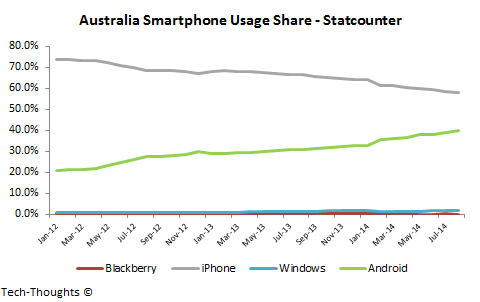 The iPhone's usage share has remained roughly flat over the past couple of years. 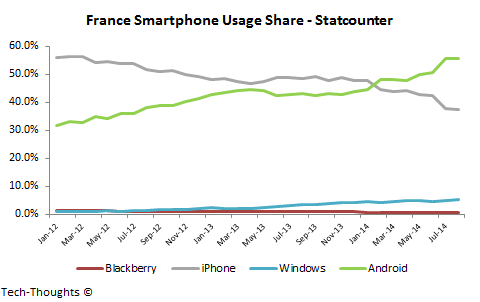 Meanwhile, Android has seen its usage share double over the same time frame. I have to wonder if this has been caused by increased uptake of high-end Android devices or an outcome of increasing quality at lower price points. We should be able to figure this out based on the impact of large screened iPhones. The charts paint a pretty clear picture. No explanation necessary. The iPhone 6 launch should tell us if this is purely driven by screen size or if there are other factors at play. The iPhone has seen a notable decline in market share over the last few months, owing to the upcoming iPhone 6 launch. 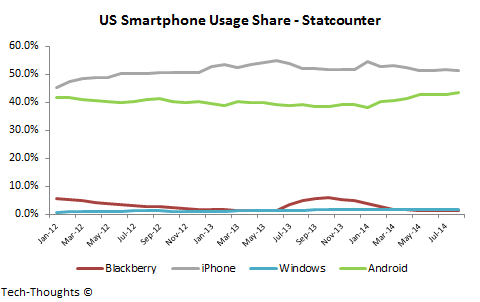 Interestingly, Android's usage share overtook the iPhone's in Q1 of this year, after the iPhone 5S launch. Large screened devices typically encourage more browsing, so it will be interesting to watch the impact of the iPhone 6 and 6 Plus. 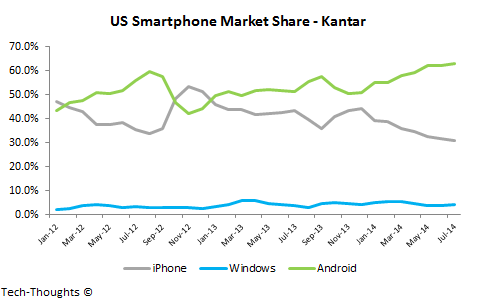 This has also been one of the few markets where Windows Phone shows up on both the market share and usage share charts. 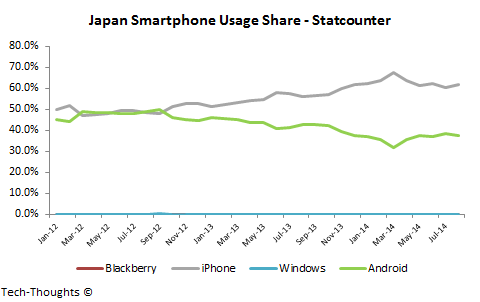 While its market share performance has fluctuated, its usage finally cracked the 5% mark. 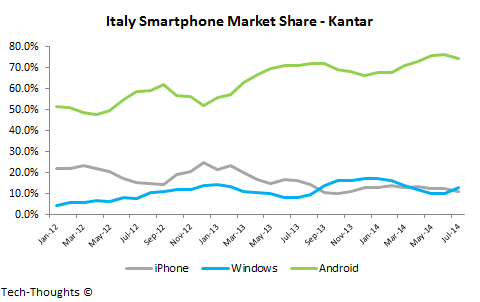 The iPhone has never been a particularly strong player in Italy, but it is interesting to see the lack of a pre-launch decline. 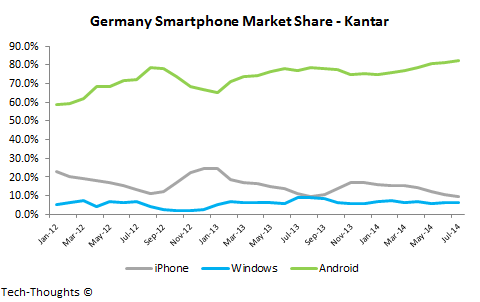 Android has dominated market share for a few years now, but Windows Phone appears to be staying alive at the ~10% range. 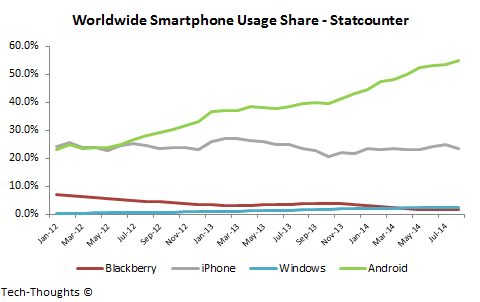 In August, it even managed to chip into Android's usage share lead, which is no small feat for a third player. 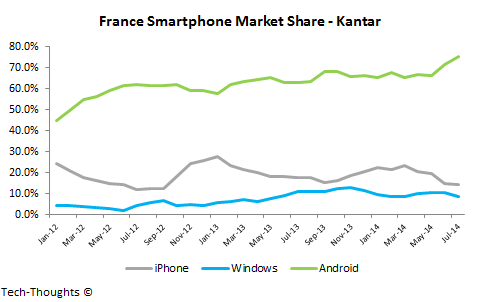 That said, both market share and usage share patterns suggest that this may be Windows Phone's ceiling. Again, these charts tell the story. 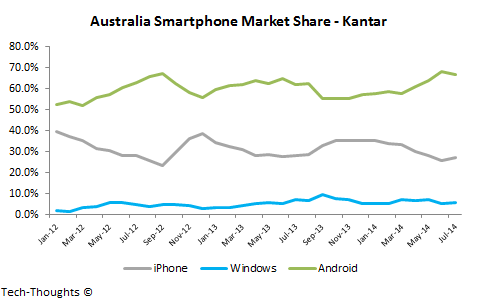 As in the UK, market share patterns in Australia have remained stable for a couple of years now. 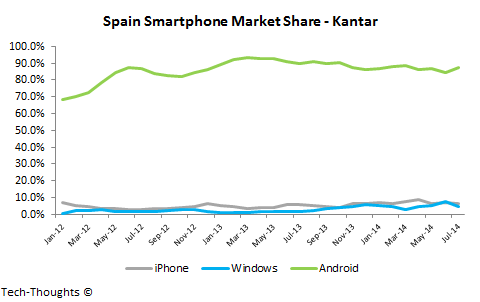 As with any other iPhone stronghold, market share is incredibly cyclical. 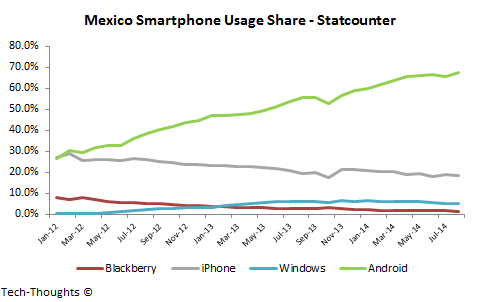 Interestingly, the usage share chart couldn't be more different as Android's share has doubled at the expense of the iPhone. This is another market to watch to gauge the impact of large screened iPhones. 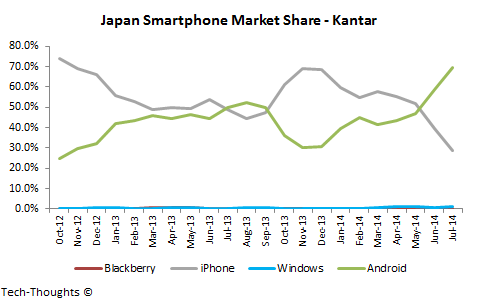 Japan is one of the iPhone's strongest markets. It is also the most cyclical and most predictable market on this list. This isn't very surprising given that carriers dominate distribution and maintain opaque pricing. Consequently, the iPhone's peak market share and usage share have grown with the number of distribution partnerships with carriers. 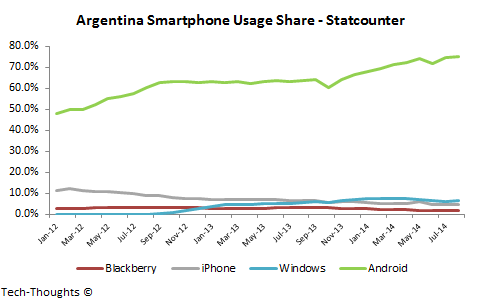 Again, the charts tell the whole story in Latin America. 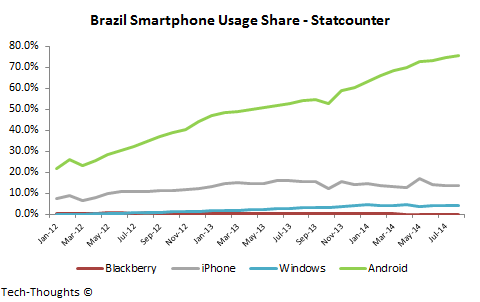 Both market share and usage share patterns are remarkably consistent across countries.